Silver Squill, Ledebouria ssp, Leopard Lily. Great container / house plant! 5 Bulbs/Plants. Silver Squill (Ledebouria) or Leopard Lily, as I like to call it, is a super easy to grow bulbous succulent that has green and grey-green spots along its thick leaves. These make great house or container plants which will multiply quicky to fill your container to overflowing with very little care! You are purchasing 5 good sized bulbs of Silver Squill (Ledebouria) or Leopard Lily, as I like to call it. It's a super easy to grow bulbous succulent that has dark green leopard spots all along its grey-green, thick, glossy leaves. I have been unable to get an identification of the exact species of Ledebouria this is, but it is a lovely plant, nonetheless! (if you know the species - please email me!) 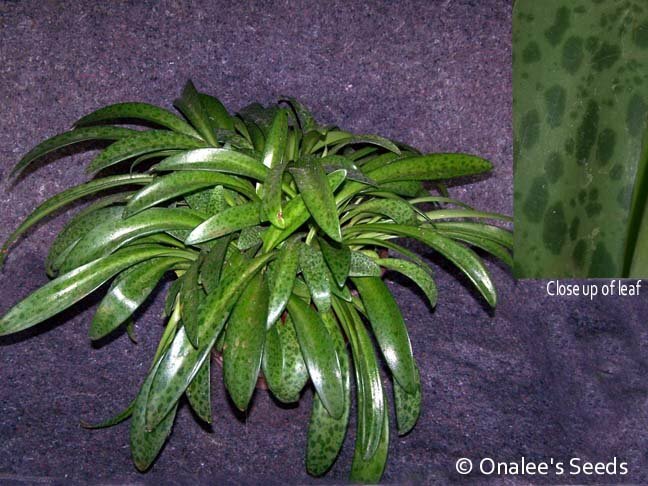 I see that most Ledebouria have a bulb that grows ABOVE GROUND, these bulbs grow below the soil line. These make great house or container plants which will multiply quicky to fill your container to overflowing with very little care! I grow mine in full shade and the wonderful colors and patterns on the leaves will add interest to any corner of your house or patio all year long. These are tender tropicals, so don't allow them to get too cold (I keep mine above 40?F). Beyond that, they require very little - water them once in a while and provide good drainage in their container and they'll amaze you with how fast they can multiply and fill your container to overflowing!